Although predicted rates of change vary, all forecasts reveal that land use changes and conversion to pine plantations will result in a continuing downward trend in naturally regenerated pine types. Changes in forest types are influenced by urbanization and timber markets: hardwood types are most strongly influenced by urbanization; softwood types are most sensitive to future timber market conditions. Reversing a 50-year trend of accumulating about 2.5 billion cubic feet per year, forest biomass is forecasted to increase slightly over the next 10 to 20 years and then decline gradually. 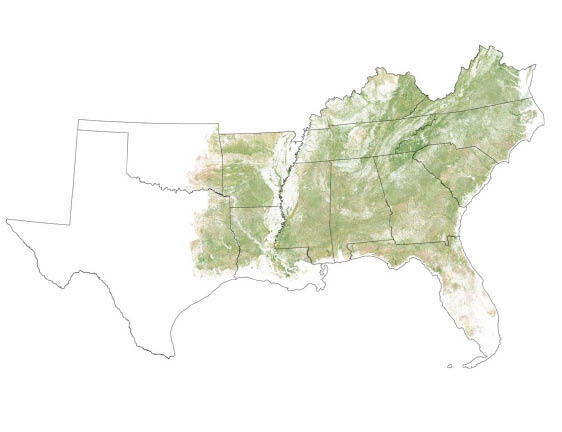 After accounting for harvests, forest growth, land use, and climate change, the total carbon pool represented by the South’s forests is forecasted to increase slightly from 2010 to 2020/2030 and then decline. Urbanization patterns are the dominant determinates of the size of the future forest carbon pool, although stronger forest product markets can ameliorate carbon losses. Because of increases in timber supply from 1990 to 2010, removals of forest biomass (growing stock) are forecasted to increase for all Cornerstones, including those that project decreasing prices. This reflects an outward shift in timber supply associated with forest inventories between 1990 and 2010. 56 percent, roughly equal to the expansion observed between 1950 and 2000. Although the overall loss of upland hardwood acreage is forecasted to be in the range of 8 to 14 percent, the oak-hickory forest type remains essentially constant while the areas of other forest types decline at higher rates. The yellow-poplar forest type is forecasted to decline the most, with the highest losses forecasted for the Piedmont. The age and species structure of softwood forest types are most strongly influenced by forest harvesting and management tied to timber markets. This is not the case for hardwood forests. The future structure of hardwood forests is most strongly affected by urbanization-driven land use changes (increased population growth and income). 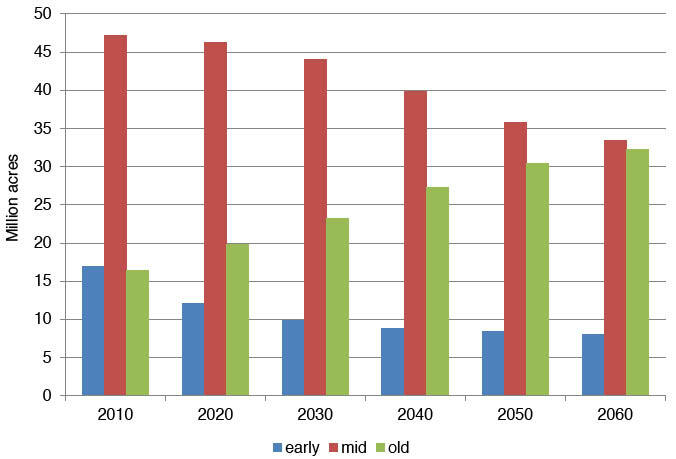 Reductions of naturally regenerated pine forests are not equally distributed among age classes. Mid-age and early-age forests decline, but old-age forests remain relatively constant. The distribution of upland and lowland hardwoods shifts, with less of these forest management types classified as early age and more classified as older age. 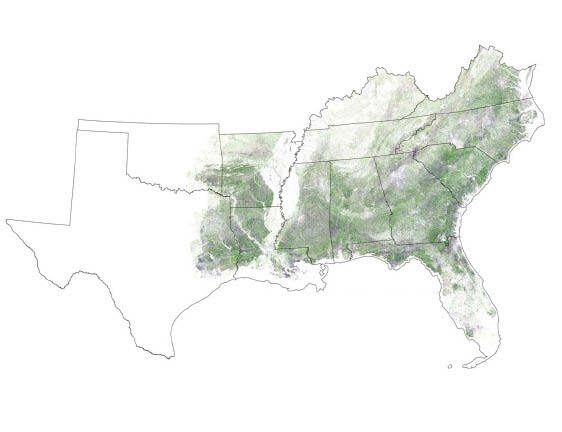 The South’s forests have been shaped by a long history of harvesting, forest management, and land use conversions. European settlers began a wave of farming and land clearing that continued to expand until around 1920 (USDA Forest Service 1988). Starting in the 1920s, extensive farm abandonment resulted in widespread forest establishment and old-field succession. With this period of forest recovery, forest area and forest biomass grew steadily through much of the 20th century and forest area peaked in the 1960s. In the 1970s and 1980s, industrial scale agriculture led to some losses in forest acreage especially in the Mississippi Alluvial Valley, and in the 1990s, urbanization became the dominant dynamic affecting forest area (Wear and Greis 2002). Despite these losses since the 1970s, the volume of growing stock (a measure of standing forest biomass) grew by more than 75 percent while industrial output of wood products more than doubled over the last half of the 20th century (Wear and others 2007). The expansion of timber harvests in the South outpaced that of all other regions of the United States. As of 2007, the South’s timber output was more than twice 1952 levels. About 60 percent of all timber produced in the United States was from southern forests (Smith and others 2009) compared to about 40 percent in 1962, indicating a shifting of production capacity to the region as well as increased output. This relocation of productive activity reflects the South’s comparative advantage in growing timber and a new product mix that favors smaller diameter trees. While softwoods comprise a majority of harvests (69 percent), hardwood harvests are also substantial. This chapter explores the ongoing and potential future changes affecting southern forests. Several uncertainties cloud our ability to predict that future. As the South’s economy expands, population and attendant urbanization continue to outpace all other regions. At the end of the 20th century, shifts in market demand slowed the steady progression of timber harvesting. New policies pursue new demands for timber to provide cellulose-based bioenergy. Anticipated climate changes raise key questions about the future productivity and composition of forests. And although forests are by their nature dynamic, there have been both an acceleration and an interaction of changes in southern forests that cannot be understood without comprehensive analysis. A modeling system designed to forecast the interactions of various social, economic, and biophysical drivers and the structure and extent of future forests is used in this chapter to explore the implications of the changes that will affect southern forests (see text box on following page, table 5.1, and fig. 5.1). Key to the system is a set of scenarios, called Cornerstone Futures, which were developed to represent a broad range of plausible futures (chapter 2). For each Cornerstone Future, the modeling system simulates changes in forest area, shifts among forest types, the amount and distribution of forest biomass, harvest removals, and changes in the forest carbon pool. 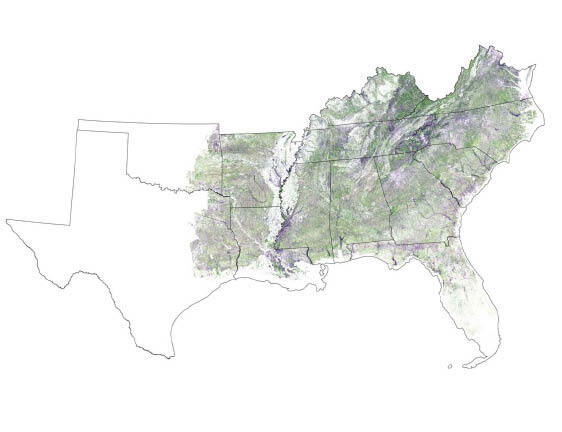 To the extent possible, we examine variation across the five subregions of the South and focus on the spatial distribution in forest conditions. These findings provide a foundation for further exploration of timber markets (chapter 9), bioenergy futures (chapter 10), and impacts on wildlife, biodiversity, and forest communities (chapter 14). 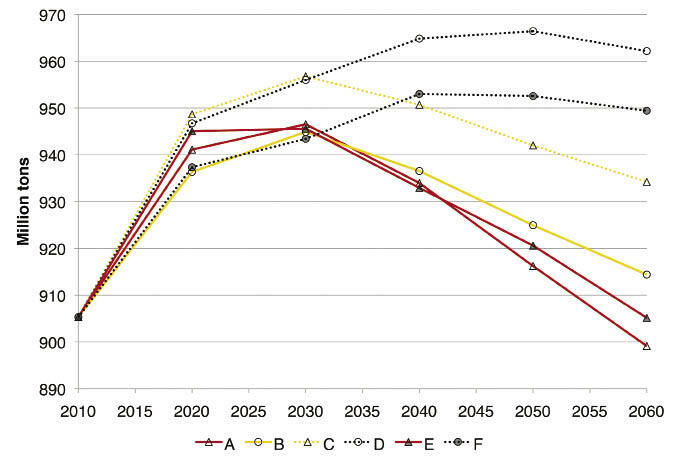 Figure 5.1—The six Cornerstone Futures defined by permutations of two 2010 Resources Planning Act (RPA) Assessment/Intergovernmental Panel on Climate Change storylines and two timber price futures; and then extended by evaluating increased and decreased forest planting rates. The Southern Forest Futures Project uses six Cornerstone Futures (labeled with letters A to F) to provide alternative scenarios regarding the future of several exogenous variables (table 5.1). These are based on a combination of county-level population/income projections from the Resources Planning Act (RPA) and Intergovernmental Panel on Climate Change (IPCC) Assessments, assumptions about future timber scarcity, and assumptions about tree planting rates (see chapter 2 for details). Two RPA/IPCC storylines, labeled A1B and B2 are used for the Cornerstones. B2 provides a lower rate of population growth (a 40 percent increase between 2010 and 2060), and A1B provides a somewhat higher rate of growth (60 percent). Income growth is higher with A1B. Both of these storylines are connected to detailed global economic/demographic scenarios that are described in the IPCC and RPA reports (IPCC 2007a, 2007b; USDA Forest Service 2012). Timber price futures either address increasing or decreasing scarcity with an orderly progression of real prices for timber: either increasing or decreasing in real terms at one percent per year from a base in 2005 through 2060. We also hold the real returns to crops constant throughout the forecasts for all Cornerstone Futures. Another element of the storylines embedded in these Cornerstones is the climate forecasted using general circulation models (GCMs) applied to the assumptions of the storylines. Forecast variables include changes in temperature, precipitation, and derived potential evapotranspiration downscaled to counties. We utilize three different GCMs in constructing the Cornerstones to address the potential variability in spatial distribution of resulting changes to forests. More detail on climate inputs to the forecasts is contained in chapters 2 and 3. In figure 5.1, the six Cornerstone Futures are displayed in a diagram that emphasizes their key variables. Cornerstones A-D are defined by the matrix formed by intersecting RPA/IPCC storylines A1B and B2 with increasing and decreasing timber price futures as described above. These four Cornerstones use historical tree planting rates following harvests (by State and forest type) to forecast future planting. Cornerstones E and F depart from these four by either augmenting planting rates for Cornerstone A (E) or by decreasing planting rates for Cornerstone D (F). The results examined in this chapter are based on the U.S. Forest Assessment System, a modeling system designed to forecast alternative futures for U.S. forests. The U.S. Forest Assessment System is a forward-looking adjunct to the Forest Inventory and Analysis (FIA) Program of the Forest Service, U.S. Department of Agriculture, and was implemented by research and development staff of the Forest Service. The FIA program provides nationwide monitoring through repeated inventories that provide consistency over time and a high level of detail. 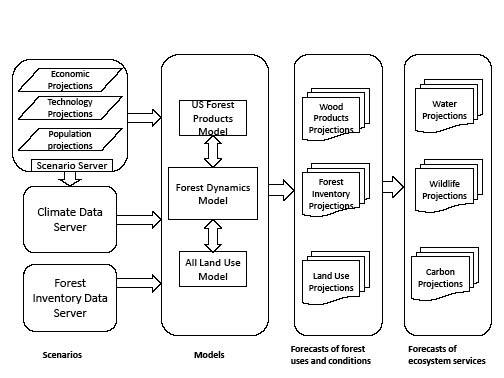 The U.S. Forest Assessment System accounts for changes driven by multiple vectors including biological, physical, and human factors to generate forecasts of forest inventories. The modeling approach is designed to address changing climate, market-driven timber harvesting, and land use changes along with changes driven by successional transitions in forest conditions. A general schematic of this modeling system (fig. 5.2) starts with a set of internally consistent combinations of social, economic, and technology forecasts defined as the Cornerstone Futures (also called Cornerstones in this book) for this application of the U.S. Forest Assessment System. Linked to the Cornerstones are various general circulation models (climate models, or GCMs), each selected to define a climate forecast that is consistent with the Cornerstone. Also linked are data from a forest inventory server, which defines starting conditions for all plots in the forest inventory. The modeling framework at the center of this system (middle column of fig. 5.2) shows how future forest conditions are driven by biological dynamics—such as growth and mortality—which in turn are affected by climate factors. In addition, human choices regarding allocations among land uses and the disposal of forest land, timber harvesting, and forest management also affect changes in forests. The interplay of all of these factors yields a set of outputs, each of which describes forest projections that are consistent with the flow of forest products and land uses. Changes in water, biodiversity, and other ecosystem services can also be derived from the forecasted changes in forest conditions and land uses. Many of these are described in subsequent chapters. The forest dynamics module of this framework provides the outputs discussed in the results section of this chapter. Within this module the future of every plot in the forest inventory is projected in a multiple stage process (see Wear and others  for details on modeling approaches). A harvest choice model assigns a management intensity choice (no harvest, partial harvest, or final harvest) based on timber prices (from a forest products module) and the condition of the plot (Polyakov and others 2010). The age of each plot is determined for the next period, and if harvested, the plot is determined to be naturally regenerated or planted. Forecasted climate including temperature and precipitation is assigned and forest conditions on the plot are inferred based on the harvest/no harvest decision, age, and climate selection. Planting probabilities are based on the frequency of planting on harvested plots based on the forest type and State for the most recent inventory period. Given the high planting levels observed over this period, forecasted rates were adjusted downward by 50 percent for Cornerstone Futures A-D. The high-planting Cornerstone Future (E) uses 75 percent of the historical planting rates while the low-planting Cornerstone Future (F) uses 25 percent. To incorporate forest market data, we adopted a simplified process that specifies a price trajectory for each Cornerstone Future and provides input both on individual plot-harvest decisions and on the overall supply of timber. Consistent with theory, higher prices yield more harvesting and larger timber supplies; lower prices yield smaller timber supplies. Harvest choice models are based on empirical analysis and are consistent with harvesting behavior observed in the late 1990s and early 2000s. The land use module (fig. 5.2) described in chapter 3 (see also Wear 2011) simulates changes in all uses of land and is driven by population and income growth along with the prices of timber products. Projections of forest area from the land use module feed into the forest dynamics module and the projection of future market conditions. Changes forecasted at the county level for non-Federal land are based on National Resources Inventory data (chapter 3) and are used to rescale the area represented by each plot in the county (also known as plot expansion factors). The assignment of future plot conditions uses a resampling of historical plot records called whole-plot imputation (Wear and others 2013), which involves the selection of a historical plot with comparable conditions to represent each plot location in the future. The selected historical plot is as close as possible to the original plot location to allow for orderly changes in conditions, e.g., if plot conditions are forecasted to be warmer, the resampling algorithm would first look within the same survey unit to find a historical plot with similar temperature increases. Finding none, the algorithm would extend the search to adjacent units until an appropriate match is found. This process is repeated for every time step (or interval between measurements or projections) to generate plot forecasts over time. The inventory forecast is completed by coupling the plot forecast with the land use forecasts, which are applied to adjust the area represented by each non-Federal plot within each county (through the plot expansion factor described above). The forest dynamics model is based on several probabilities, including probabilistic harvest choice, forest investment, and forest transition models that are implemented with random draws from probability distributions, and a whole-plot imputation that is based on a random selection of a subset of historical plots with replacement. Forecasts therefore may vary between runs of the model. The forecasts for the 50-year simulation in this chapter are based on 26 runs, one of which was selected as representative based on central tendency across several variables. The full suite of 26 runs offers information about the uncertainty of the forecasts and is used whenever confidence intervals are needed. The time step of the simulation depends on the FIA inventories that underlie much of the modeling (Wear and others 2013). Because starting years and time step vary from State to State, the forecast periods are staggered across the region, e.g., a State might have a time step of 6 years starting in 2007, while another State might have a time step of 6 years starting in 2008. For reporting across the region, we selected 10-year intervals, each beginning with a zero-ending year, e.g., 1990, and then attached forecasts from the nearest year to the referenced decade—identical to how FIA assigns years for aggregate inventories (Smith and others 2007). 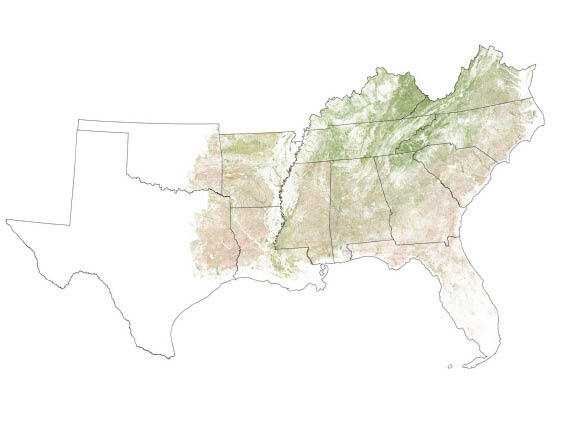 The reports and maps in this chapter show changing forest conditions for the forecast period (2010 to 2060) in enough detail to depict a complete forest inventory for each State in the South. We focused on forecasting the volume of forest biomass, the area of forests by type and age class, the carbon contained in above- and belowground pools, and removals from forests determined by forest product harvests and land use changes. 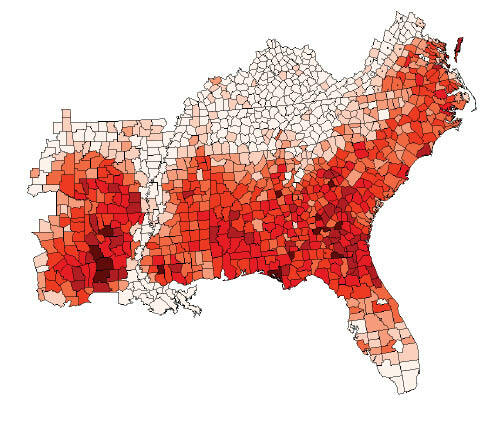 Our approach was to summarize total changes for the South and their distribution across subregions. Figure 5.2—Schematic of the U.S. Forest Assessment System. For each State, FIA plot records were available to populate the forest dynamics model and conduct the resampling. We required at least two inventory panels of matched plots, ideally with both derived from the continuous inventory design that was implemented in 1998 to replace complete-but-periodic inventories of the past with annual updates. Because of changes in the plot measurement approach, we determined that it was important to use two panels of comparable design to construct transition models for key variables. So when faced with the dilemma of only one available continuous inventory, we opted for panels from two older (periodic) inventories rather than rely on two different designs. From publicly available plot tables located on the FIA Web site, we extracted raw data on plot characteristics, discrete landscape features, and measurements of trees larger than 1-inch d.b.h. We were also granted access to confidential plot location data, allowing us to conduct the plot matching needed to evaluate transitions over time. Expansion factors, the area associated with each plot, were attached to the plots with the appropriate tables. Each plot’s county links it to the land use model (see chapter 3). Because the FIA inventory is extensive, we performed some manipulations on the raw data to allow us to summarize values for analysis. Biomass variables, such as the volume and number of growing-stock trees, were calculated on a per acre basis using algorithms derived from Miles and others (2001) to account for changes in survey methodology over the years. For example, plots in the annual inventory panels were divided into components to capture condition-level details such as forest type. As a validation step we generated total values for States and survey units, which could then be compared with published reports and confirm the accuracy of the algorithms. Changes in algorithms, recording, and measurement techniques created data anomalies in many inventories. We compared attributes across inventories in each State to determine where data adjustments were required. This was especially crucial when conducting the analysis of transitions. Carbon estimates are attached to each historical plot using models developed and applied by FIA using the U.S. Forest Carbon Calculation Tool (Smith and others 2007). This tool incorporates estimates derived from field measures into the FORCARB2 model to provide carbon inventories that are consistent with standards developed by the Intergovernmental Panel on Climate Change (Penman and others 2003). We also attached ancillary grid-level climate data to each forested plot in the inventory. Historical climate variables for a 67-year period (1940 to 2006) were derived from the PRISM (Parameter-elevation Regressions on Independent Slopes Model) database, which provides monthly values. 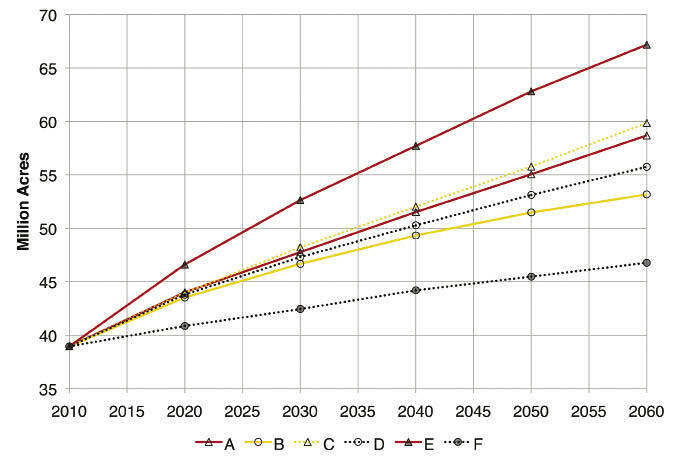 Climate forecasts for each of the Cornerstone Futures (chapters 2 and 3) derive from a database developed by Coulson and others (2010). To create the set of forecasted variables, climate projections or “deltas” from this database are applied to the 1961-1990 “normals” defined by the PRISM grid data to create the set of forecasted variables. For both the historical and forecasted series we create monthly county-level averages for precipitation, minimum and maximum temperatures, and potential evapotranspiration (Linacre 1977). Climate variables are assigned to each plot based on the county in which the plot is located and the age of the plot, e.g., a 40-year old plot in 2020 would have climate data averaged over the previous 40 years, which would include the history from 1980 to 2006 and the forecast from 2007 to 2020. Each plot represents several hundred acres of forest within a county so county averages may be more representative than more precise grid cell estimates. To estimate timber harvest models, we calculated potential revenues from alternative treatments of each plot (full harvest, partial harvest, or deferred harvest). This required volume measures derived from the inventory records and timber product prices (chapter 2). Product prices were defined as the average of stumpage prices recorded during the observation period for each survey unit and reported by Timber Mart South, a region-wide price tracking service funded by the Frank W. Norris Foundation. The starting year for price projections is 2006. Forecasts of forest area change derive from the land use analysis contained in chapter 3. All Cornerstone Futures predict declines in forest area with losses ranging from 4 to 21 million acres (2-10 percent) by 2060, the result of population- and income-driven urbanization and of changes in the relative price of timber products (fig. 5.3). The smallest loss of forest area is forecasted for Cornerstone C, which has the lowest population growth and income growth resulting in lowest urbanization, and increasing timber prices resulting in shifts of some rural land toward forest uses. The largest loss of forest area is forecasted for Cornerstone B, where population growth is moderate but income growth is strong (resulting in high urbanization), and timber prices are falling (resulting in shifts of forest land to agricultural uses). 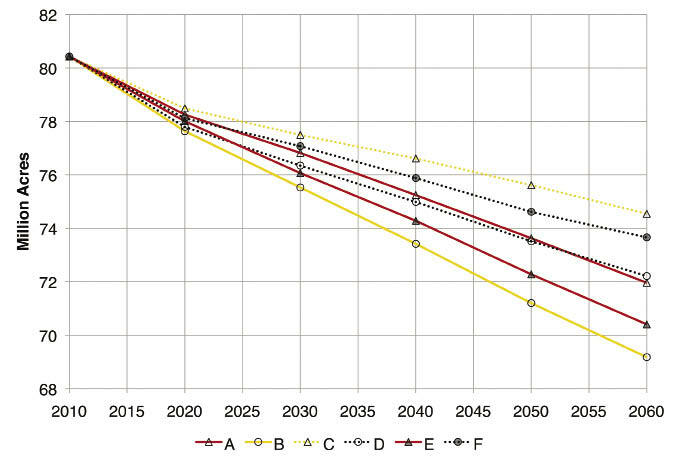 Figure 5.3 also shows that price effects dominate the projection of forest area, with the highest forest loss associated with Cornerstones that have decreasing prices (B, D, and F); the three Cornerstones with the lowest forest loss have increasing prices (A, C, and E). 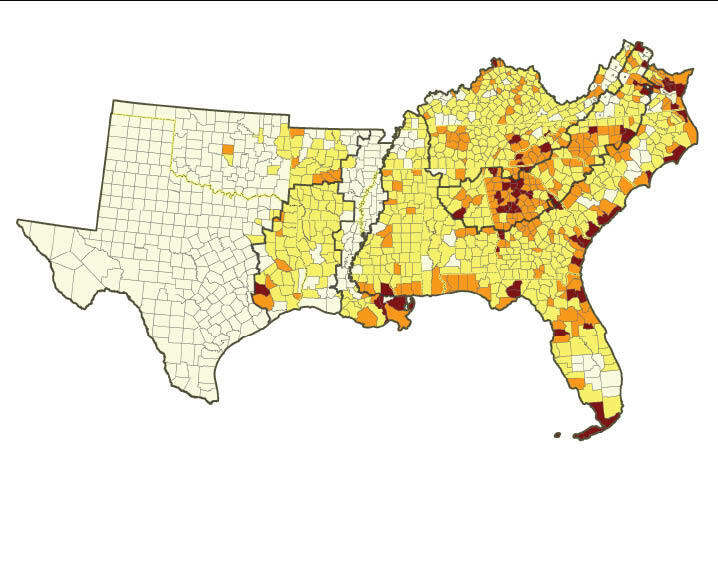 Forest losses are especially high in a few areas of the South (fig. 5.4). For all Cornerstone Futures forest losses are concentrated in the Piedmont from northern Georgia though North Carolina and parts of Virginia, the Atlantic and Gulf of Mexico coastal areas, and the area surrounding Houston. The income-fueled urbanization in Cornerstones A and B spreads low intensity forest losses across a broader area of the South (chapter 3). For all Cornerstones, the number of acres lost is largest in the Coastal Plain and smallest in the Mississippi Alluvial Valley and the Mid-South. The percent of acres lost is largest in the Piedmont followed by the Appalachian-Cumberland highlands and the Coastal Plain. Forest area change also varies across the five forest management types: planted pine, natural pine, oak-pine, upland hardwood, and lowland hardwood. The upland and lowland hardwood types are forecasted to comprise between 51 and 53 percent of all forests in 2060, a decline from about 54 percent in 2010 (fig. 5.5). The greatest changes however are found among the softwood types (planted pine, natural pine, and oak-pine). These forest dynamics are heavily influenced by management for forest products, which in turn is driven by timber market conditions, and by the rate of forest planting. Planted pine–Of the five forest management types in the South, only planted pine is forecasted to increase in spite of overall declines in forested area. 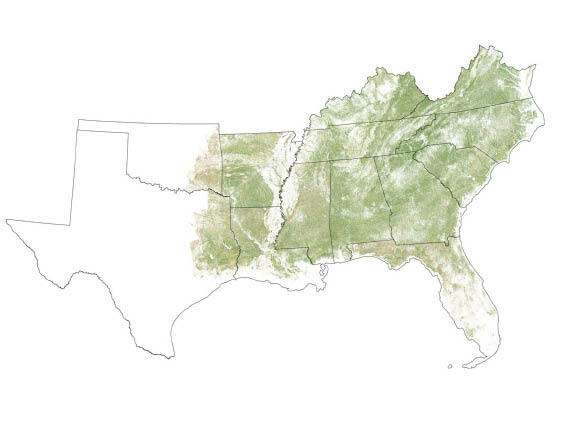 The South now contains 39 million acres of planted pine (about 19 percent of total forest area), the culmination of an upward trend that started in the 1950s. 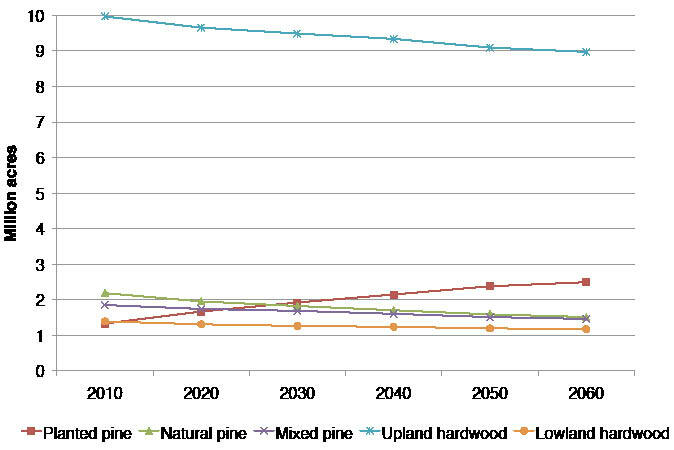 Our projections of planted pine are driven by urbanization, timber prices, and planting rates (fig. 5.6). Cornerstone E, characterized by a relatively high level of urbanization as well as high timber prices and planting rates, produces the largest expansion in planted pine (though at rates lower than those experienced in the 1990s) and yields an increase of 28.2 million acres by 2060 (about 560,000 acres per year). Under this Cornerstone, 34 percent of forests would be planted pine in 2060. Conversely, Cornerstone F, characterized by a relatively low level of urbanization as well as low timber prices and planting rates, yields the smallest gain in planted pine area with an increase of 7.8 million acres by 2060 (24 percent of forest area). The remaining Cornerstones have projections that are intermediate to these results. They cluster around the forecast for Cornerstone D with its lower timber prices and slower urbanization: a gain of 16.8 million acres (about 0.3 million acres per year) with planted pine comprising 28 percent of the forest acreage in 2060. 31.5 million acres in 2010 to 13.5 million acres in 2060—is associated with Cornerstone E, which has the highest planting rates. The smallest decline occurs with Cornerstone F, with its lower timber prices and planting rates, but losses are still substantial—7.6 million acres or 25 percent from 2010 to 2060. 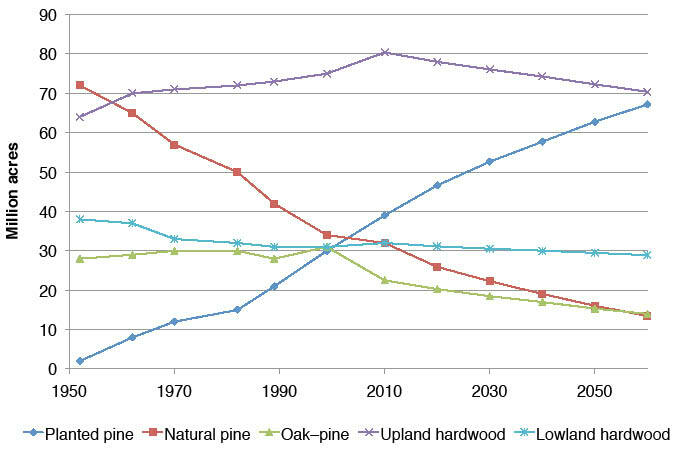 Regardless of the Cornerstone evaluated, naturally regenerated pine types are forecasted to decline, continuing a trend that has dominated forest type dynamics since the 1960s. Oak-pine—The area of the oak-pine forest management type also declines for all Cornerstone Futures, with a similar pattern of change but smaller acreage and percent changes than is forecasted for natural pines (fig. 5.6). As with natural pine, oak-pine is more heavily influenced by timber market conditions than by urbanization rates. Oak-pine declines range from 8.5 million acres (38 percent) to 3.9 million acres (17 percent) by the year 2060. Upland hardwood—At more than 80 million acres in 2010, upland hardwoods are the predominant forest type in the South, more than double the area of the next largest forest type. 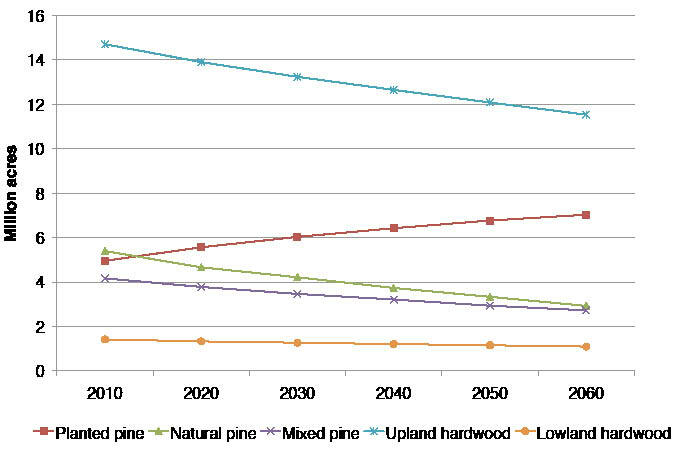 Upland hardwoods are forecasted to decline for all Cornerstone Futures (fig. 5.6), and variations in forecasts are associated more with the rate of urbanization than with timber market futures. 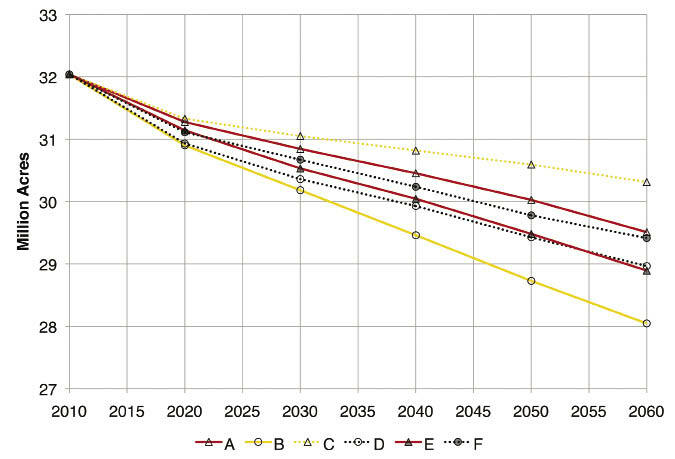 The three Cornerstones with the lowest upland forest loss are associated with lower urbanization (Cornerstones C, D, and F), and the three with the highest loss are associated with the higher urbanization forecasts (Cornerstones A, B, and E). Loss of upland hardwood forests ranges from 5.9 million acres (about 8 percent) for Cornerstone C to 11.2 million acres (14 percent) for Cornerstone B. 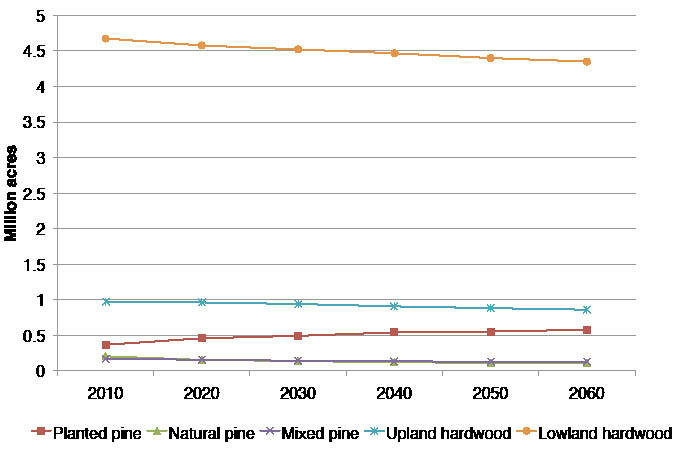 For Cornerstone E, which is also characterized by high timber prices but with even higher rates of planting, the projected total area of planted pine forest would be nearly equal to upland hardwood forests in 2060, as the stimulating effects of price and planting on the pine type combines with the depressing effects of urbanization on the hardwood type. 32 million acres in 2010. 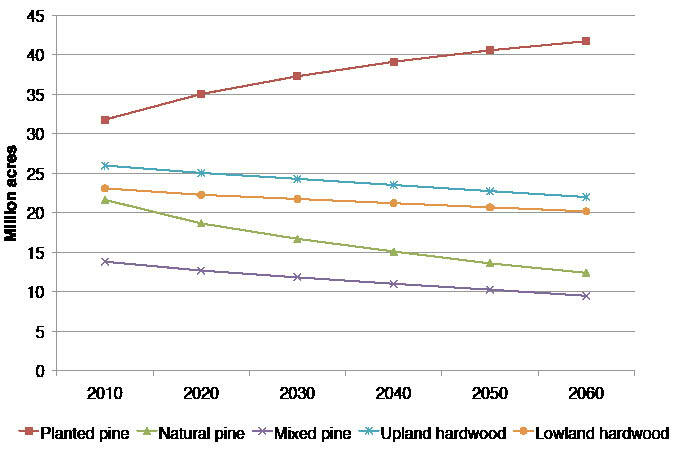 The relative ranking of change across Cornerstone Futures is identical to the forecasts for upland hardwood types. Lowland forests lose proportionally less area than the other forest types that experience losses. 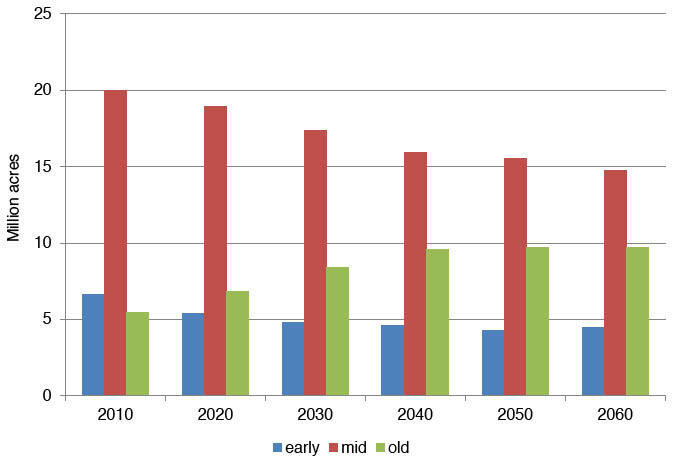 The forecasts of forest type dynamics vary across the Futures Project subregions (figs. 5.7, 5.8, and 5.9). 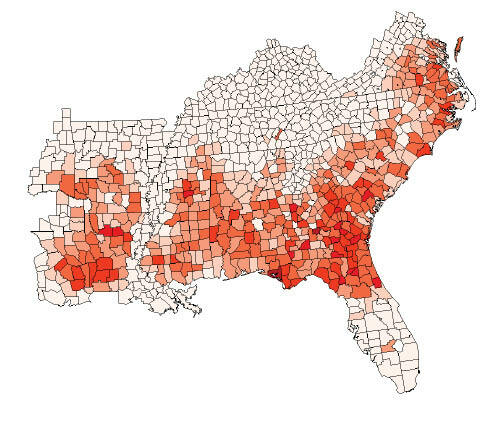 Forest losses, especially concentrated in the Piedmont and Appalachian-Cumberland regions (figs. 5.7), and intensive management in the Coastal Plain influence forest types differently. The Coastal Plain, with 82 percent of planted pine in 2010, experiences the greatest growth in planted pine area, from 32 million acres to 43 million acres. Declines in naturally regenerated pine are greatest in the Coastal Plain as well. Upland hardwood losses are greatest in the Piedmont and in the Appalachian-Cumberland subregion reflecting the influence of urbanization on these types. 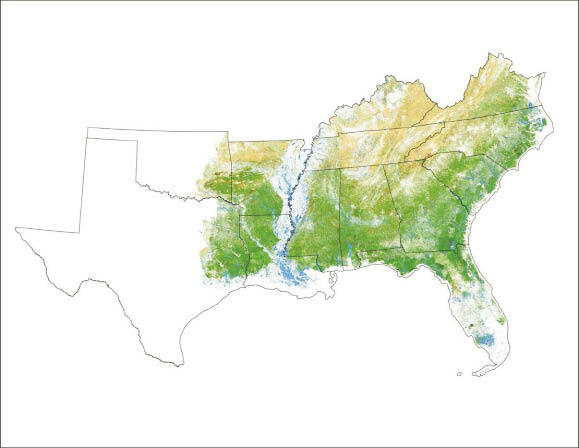 Changes in lowland hardwood types are more evenly spread across the South. 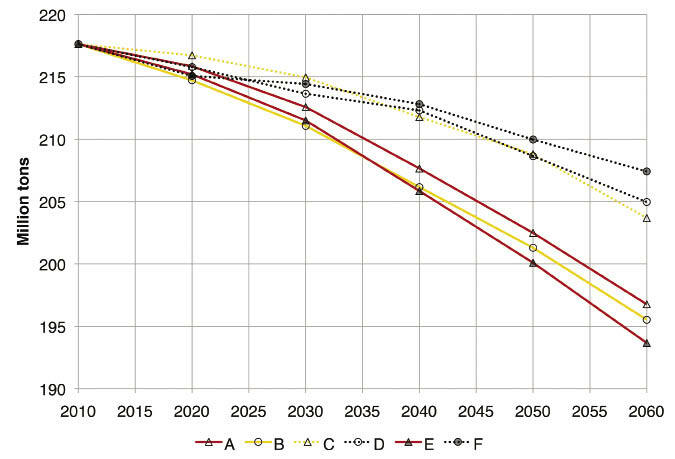 Figure 5.3—Forecasted total forest area, 2010 to 2060, by Cornerstone Future. Cornerstones A and E share a land use model, as do cornerstones D and F. The figure shows the overlapping trajectories for these. 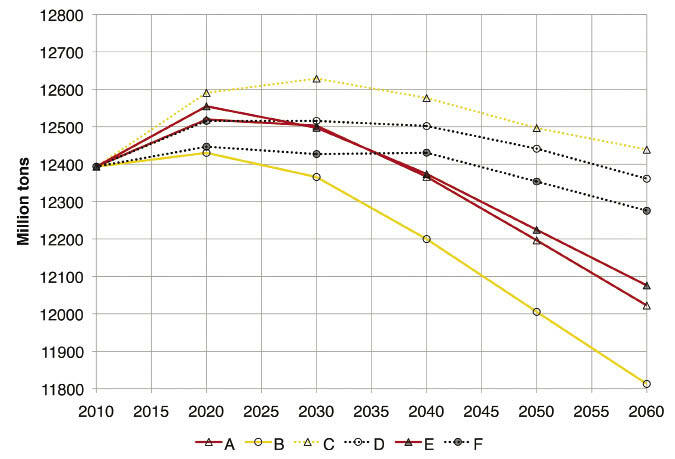 Figure 5.4—Forecasted change in the proportion of county in forest land, 1997 to 2060, for Cornerstone B, which is characterized by high urbanization and low timber prices. 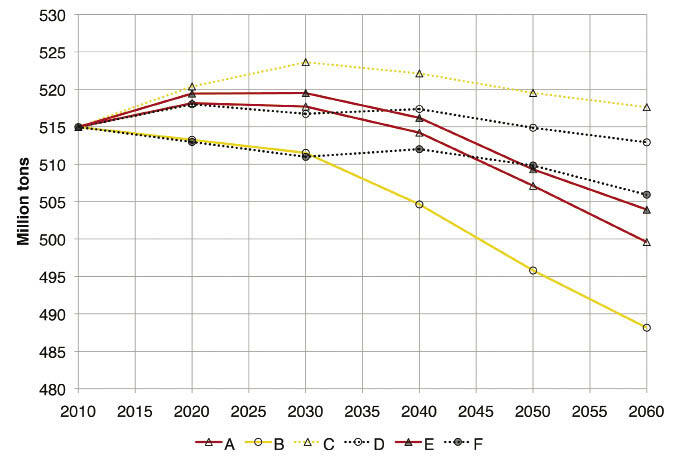 Figure 5.5—Forecasted forest area by forest management type, 1952 to 2060, for (A) Cornerstone E, which is characterized by high urbanization, high timber prices, and more planting; and (B) Cornerstone F, which is characterized by low urbanization, low timber prices, and less planting. and (E) lowland hardwood management types. 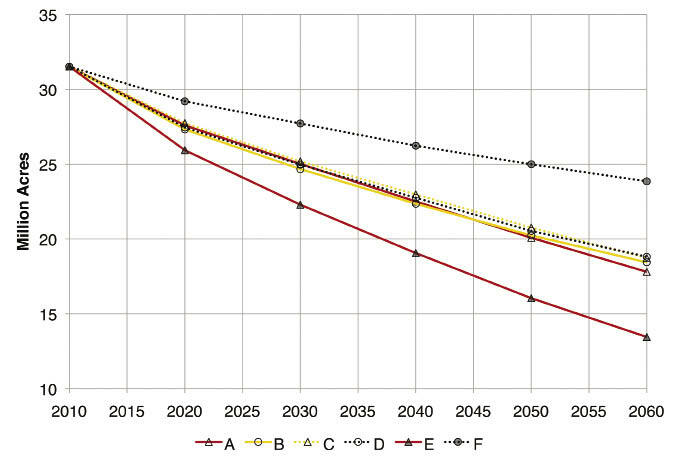 Figure 5.7—County-level presence of forest types (A) for 2010 and (B) forecasted for 2060 under Cornerstone A, which is characterized by high urbanization and high timber prices. 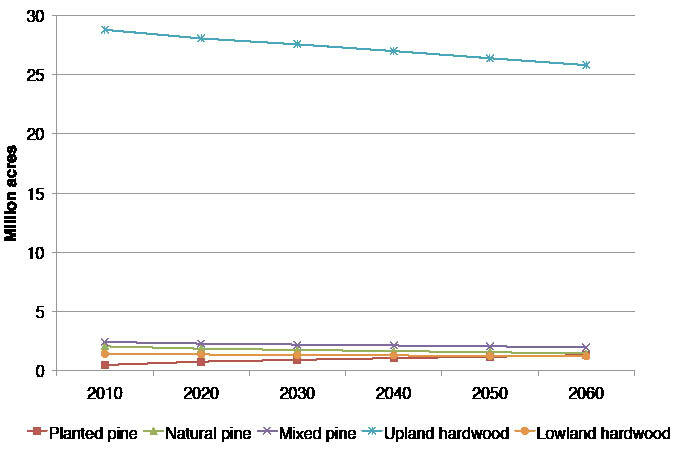 Figure 5.8—Forest land in planted pine (A) estimated for 2010 and (B) forecasted for 2060 under Cornerstone E, which is characterized by high urbanization, high timber prices, and more planting. 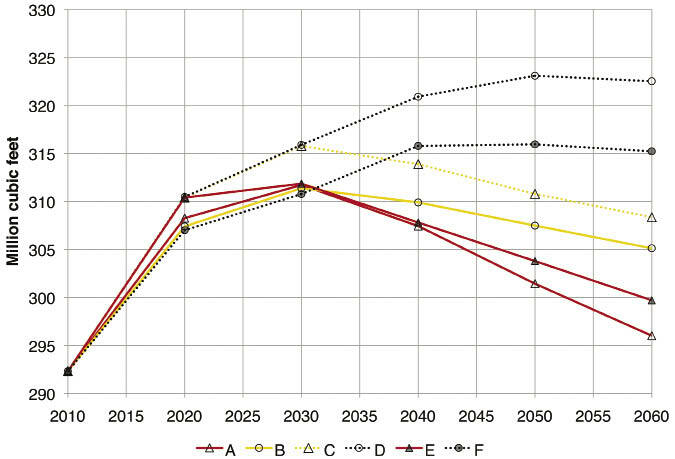 Figure 5.9—Forecasted forest area by forest management type, 2010 to 2060, for (A) Piedmont, (B) Coastal Plain, (C) Appalachian-Cumberland highlands, (D) Mississippi Alluvial Valley, and (E) Mid-South under Cornerstone B, which is characterized by high urbanization and low timber prices. 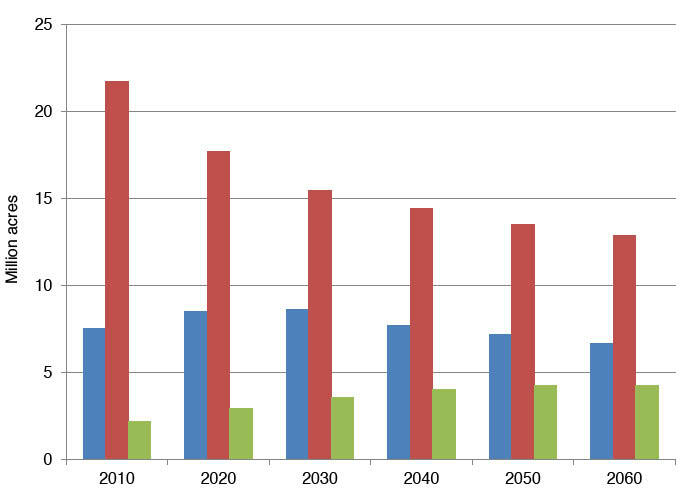 Figure 5.10—Total growing stock volume, 2010 to 2060, by Cornerstone Future. 11 percent in 2060 under the low-urbanization/low-timber-price Cornerstone D. The smallest increase in total growing stock inventories is found with the high-urbanization/high-timber-price Cornerstone A, with an increase in volume to 2030 and then a decline over the remainder of the forecast period. Under this Cornerstone, the volume in 2060 is about 1 percent higher than values observed in 2010. Patterns of change differ between hardwood and softwood components of the inventory and generate generally countervailing changes. Under all Cornerstones, softwood growing stock inventories increase (fig. 5.11). For the low-urbanization/low-timber-price Cornerstone D, softwood inventories increase from a base of about 121 billion cubic feet in 2010 to as much as 148 billion cubic feet (37 billion cubic feet or 22 percent). The smallest increase is 15 percent (18 billion cubic feet) for the high-urbanization/high-timber-prices Cornerstone A. 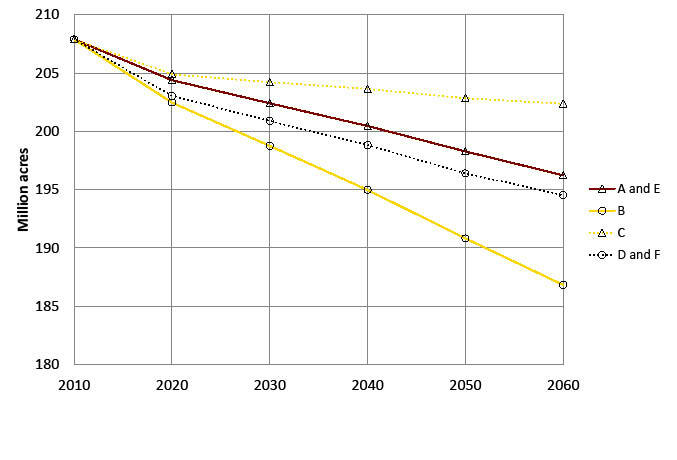 (9 percent) from 2010 to 2060. Cornerstones F and D result in increases of 3 billion cubic feet (2 percent) for the same period. These changes in growing stock volume depart from historical patterns of volume accumulation in the South. Between 1963 and 2010 southern forests accumulated about 2.5 billion cubic feet per year or roughly 70 percent. Hardwood forests accounted for most of this biomass accumulation (61 percent). Although growth is projected to continue over at least the next 10 years, growing stock volume reaches a maximum and then declines somewhat over the following 40 years (fig. 5.12), with hardwood growing stocks declining, especially in response to urbanization (Cornerstone A), while softwood volumes increase only slightly. Figures 5.13, 5.14, and 5.15 show county-level changes in growing stock volume from 2010 to 2060 for the high-urbanization/high-timber-prices Cornerstone A. While softwood growing stock increases overall, areas with large increases in planted pine (fig. 5.8) show declines in softwood growing stock volumes as older naturally regenerated pine forests are replaced by younger planted pine forests (fig. 5.14). Declines in hardwood growing stock volumes between 2010 and 2060 are more widespread and generally organized by urbanization patterns (fig. 5.15). Eastern Kentucky and far western Virginia show the greatest gains in hardwood growing stock volumes. Figure 5.11—Total growing stock volume, 2010 to 2060, for (A) softwoods and (B) hardwoods by Cornerstone Future. 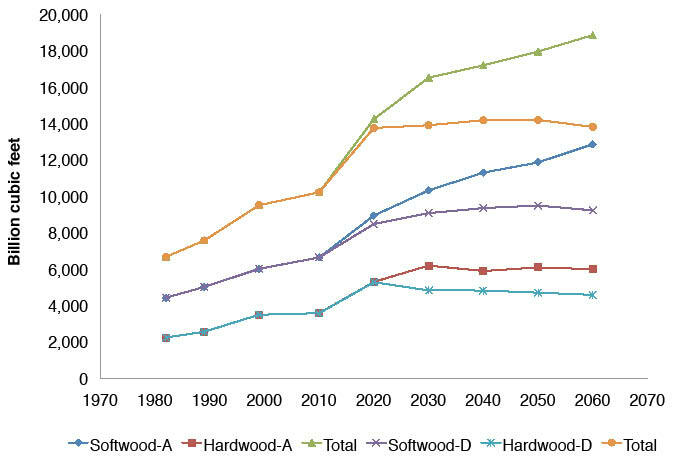 Figure 5.12—Historical (1962 to 1999) and forecasted (2020 to 2060) hardwood and softwood growing stock inventories, for Cornerstones A and D.
Figure 5.13—County-level density of total growing stock volume (A) for 2010 and (B) forecasted for 2060, and (C) change in total growing stock between 2010 and 2060 under Cornerstone A, which is characterized by high urbanization and high timber prices. 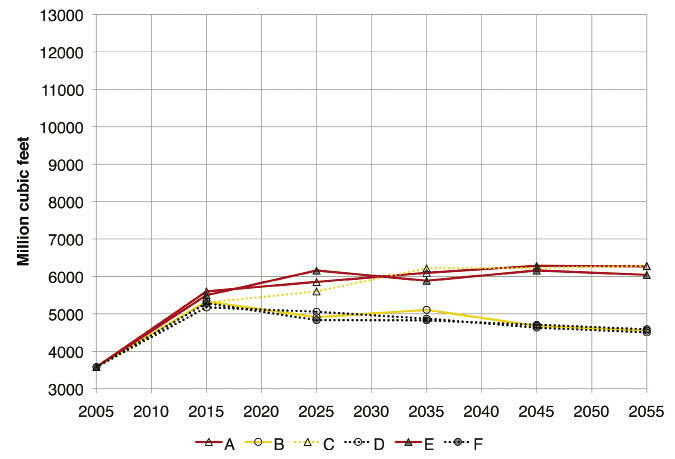 Figure 5.14—County-level density of softwood growing stock volume (A) for 2010 and (B) forecasted for 2060, and (C) change in softwood growing stock between 2010 and 2060 under Cornerstone A, which is characterized by high urbanization and high timber prices. 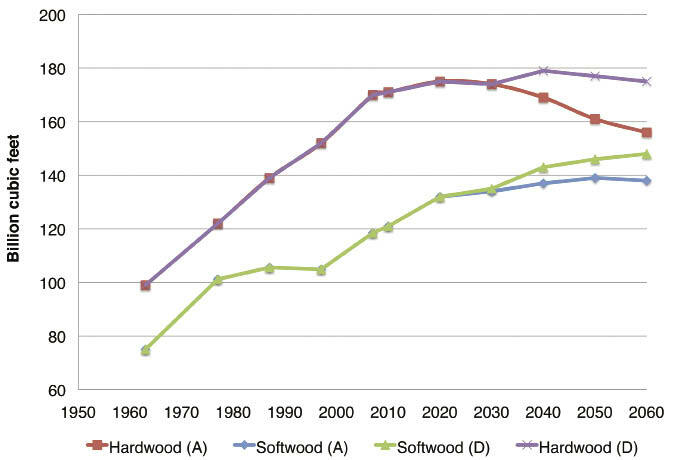 Figure 5.15—County-level density of hardwood growing stock volume (A) for 2010 and (B) forecasted for 2060, and (C) change in hardwood growing stock between 2010 and 2060 under Cornerstone A, which is characterized by high urbanization and high timber prices. 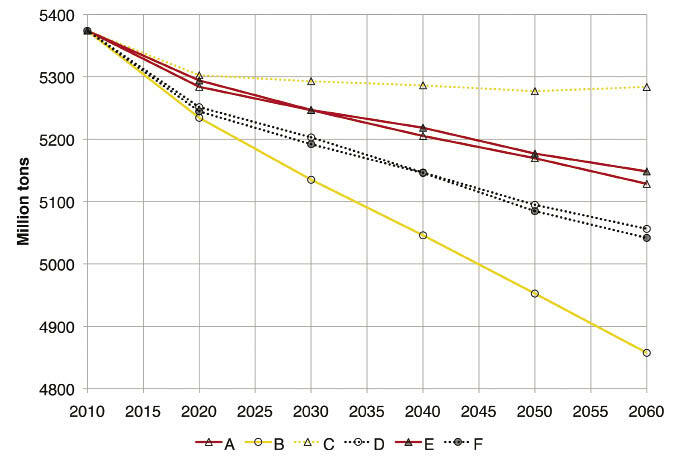 Figure 5.16—Total forest carbon stock, 2010 to 2060, by Cornerstone Future. We estimate the carbon stored in southern forests in 2010 at about 12.4 billion tons, including carbon stored in eight pools: down trees, standing dead trees, litter, soil organic carbon, live trees aboveground and belowground, and understory plants aboveground and belowground. Aboveground live trees and soil organic material comprise 80 percent of the total carbon stock. Forecasts of future forest carbon stocks reflect changes in the amount of forest area and the composition of the forest inventory. However, the model tracks only the carbon pool in forests and does not account for carbon transfers to agricultural and other land use pools. Likewise, the model does not account for carbon that leaves forests as products and may remain sequestered for long periods of time in housing or other end uses (e.g., Heath and others 2011). Changes in forest carbon pools reflect both changes in growing stock volumes and changes in forest area (figs. 5.16 and 5.17). Under most Cornerstones, tree carbon peaks in 2020 and then levels off or declines; the exception is the low-urbanization/high-timber-prices Cornerstone C whose forecast peaks in 2030. At most, the forest carbon pool in 2060 is 5 percent smaller than the pool in 2010 (a net emission of about 600 million tons). Carbon accumulates as a result of net biomass growth on forested lands (fig. 5.17.F), but these gains are offset by the loss of forested land through urbanizations (i.e., the loss of soil carbon shown in fig. 5.17.D). The clustering of carbon forecasts in Figure 5.16 reveals the interplay of urbanization and timber prices. 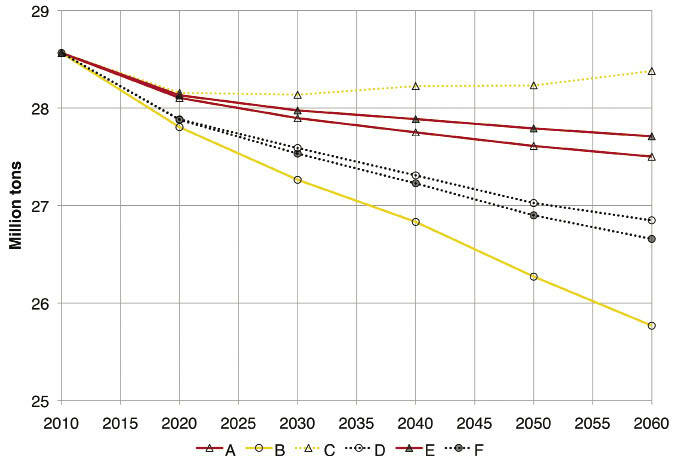 The forecasts with the highest amount of carbon in 2060 are for the low-urbanization Cornerstones (C, D, and F). 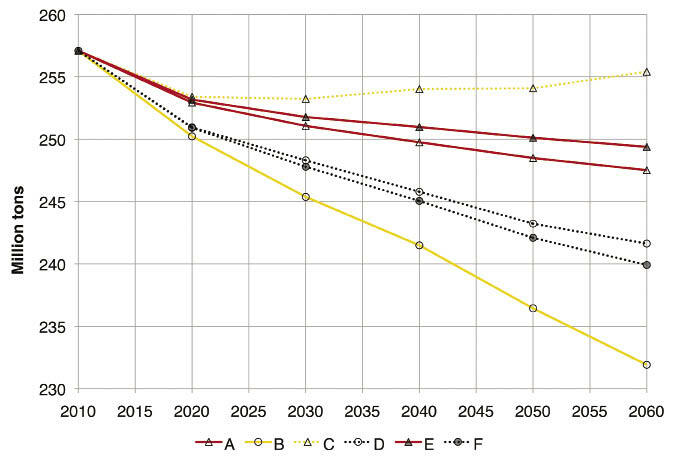 The lowest carbon forecasted is for the high-urbanization Cornerstones (A, B, and E). However, within each of these triplets the lowest amount of carbon is associated with low timber prices (Cornerstones B, D, and F) while higher timber prices and resulting intensive forest management lead to higher carbon sequestered in the forest pool. This suggests that urbanization patterns dominate the forecasts of carbon storage while stronger forest product markets can ameliorate carbon losses. 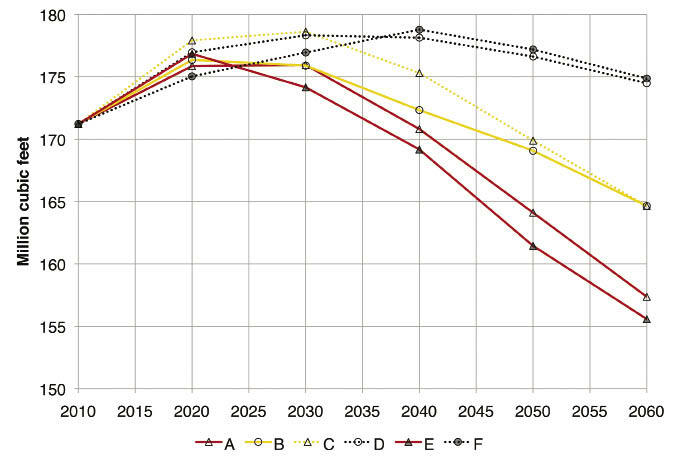 Figure 5.17—Forecasted forest carbon stock, 2010 to 2060, by Cornerstone Future for (A) down trees, (B) standing dead trees, (C) litter, (D) soil organic carbon, (E) live trees aboveground, (F) live trees belowground, (G) understory plants aboveground, and (H) understory plants belowground. (A, C, and E) while the lowest removals are associated with low price Cornerstones (B, D, and F). Even with declining prices, harvests are projected to increase, reflecting previous forest investments, maturation of forest inventories, and removals associated with forest losses. The forecasts generate distinctly different removal patterns for hardwoods and softwoods (fig. 5.19). Softwood removals are forecasted to increase steadily over the projection period and at rates comparable to recent history. For hardwoods, forecasted removals increase from 2010 to 2020 and then level off for most Cornerstones. The increase in the first decade reflects the recovery from suppressed removals leading up to and during the “great recession” (2005 to 2010). Trends in later decades reflect a decline in hardwood growing stock inventories, most especially in the pulpwood size classes. Among products, softwood pulpwood removals are the most variable across Cornerstones, with forecasts ranging between 2,800 million cubic feet for the low-planting future of Cornerstone F and 3,900 million cubic feet for the high-planting future of Cornerstone E by 2060 (see chapter 9 for a discussion of timber supply and timber market forecasts related to the Cornerstone Futures). Historically, because the pines are the dominant plantation species, pine pulpwood has been the most price-responsive timber product in the South. Over the long run, the high-price futures of Cornerstones A and C produce more pulpwood than the low-price futures of Cornerstones B and D, and the high-prices/more-planting future of Cornerstone E produces the most substantial increase in softwood pulpwood output (about 56 percent). Softwood sawtimber removals also show strong growth potential across the Cornerstones and are also strongly affected by price forecasts (fig 5.19). In contrast to pulpwood however, sawtimber output levels off over time and is not strongly influenced by planting rates. Naturally regenerated sites are maturing in the South, resulting in growth-induced supply increases. This explains why it is possible for softwood sawtimber output to remain stable or increase with decreasing prices. Softwood sawtimber output eventually levels off as the area of natural pine declines over time. While still separated by low and high price Cornerstones, hardwood removal forecasts vary much less than softwood removals (figs. 5.20). After increasing from 2010 to 2020, hardwood removals are forecasted to decline for the low price Cornerstones (B, D, and F). For the high price Cornerstones (A, C, and E), removals increase until 2030, when they begin to level off. In contrast to the softwoods, direct investment in southern hardwood forests has been negligible, and none is projected for the future. The result is a steady drop in hardwood forest area and in hardwood growing stock inventories. When considered together, growing stock and removal forecasts indicate a continuation of some important historical trends. Removals are forecasted to increase substantially in spite of a leveling off of inventories (fig. 5.21). This reflects an ongoing transition from a forest mining approach to an agricultural model of forest production. Planted pine management allows for more production from a smaller land base with a more frequent capture of forest growth. This means lower inventories on the ground compared to naturally regenerated forests. 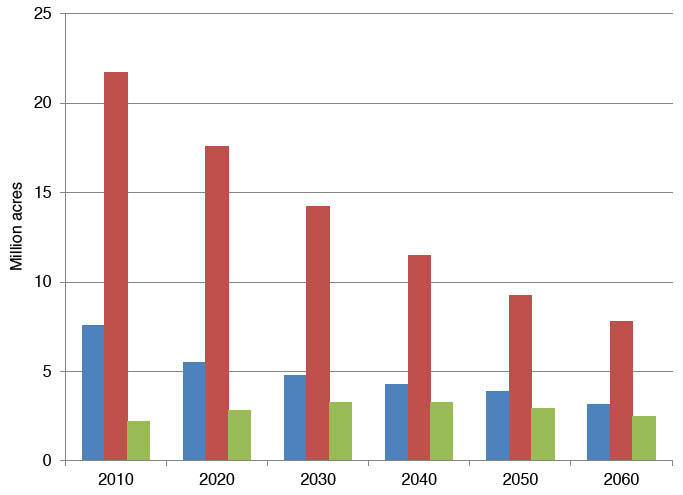 Figure 5.18—Forecasts of total removals from growing stock, 2010 to 2060, by Cornerstone Future. 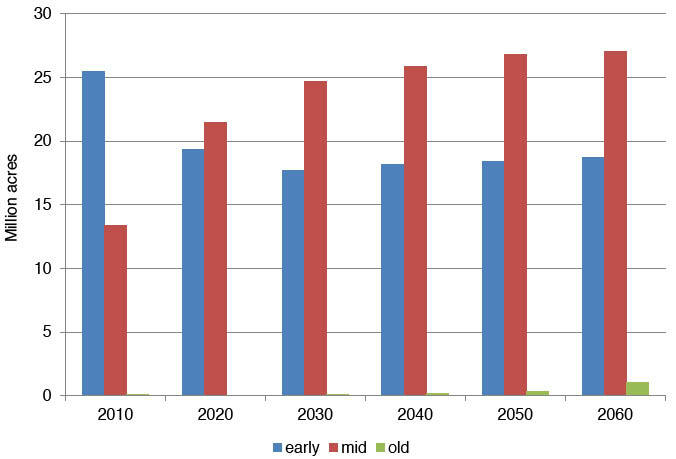 Figure 5.19—Forecasted removals from softwood growing stock, 2010 to 2060, by Cornerstone Future. 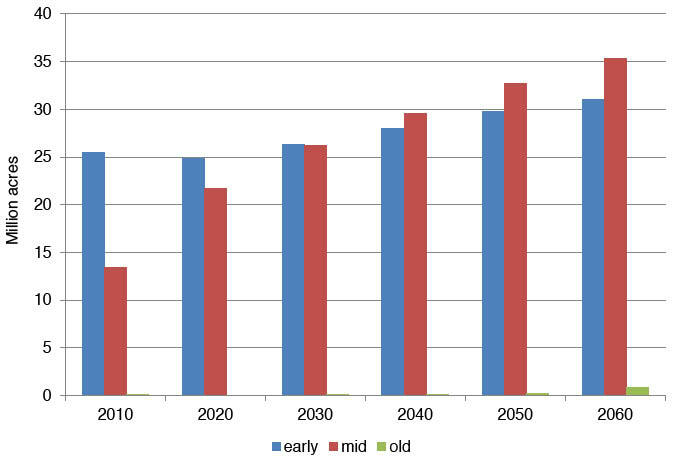 Figure 5.20—Forecasted removals from softwood growing stock, 2010 to 2060, by Cornerstone Future. Figure 5.21—Historical and forecasted hardwood and softwood removals for Cornerstone A, which is characterized by high timber prices; and Cornerstone D, which is characterized by low timber prices. 34 percent in the Piedmont (1.6 million acres). The forecasted area of softwood types is shown in figure 5.23. Loblolly-shortleaf pine is the dominant type and its area stays roughly level through the forecast period. Although overall forest area is expected to decline and softwood removals are forecast to increase, continued investment in plantations enables this type to maintain its area. 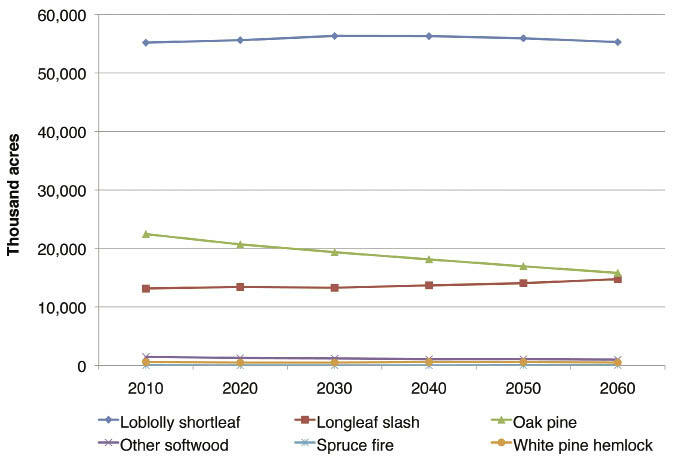 Longleaf-slash pine is forecasted to increase slightly while oak-pine is expected to decline. All other types exhibit very little change. Another element of forest conditions that may be especially important for wildlife is the age class distribution of forest types (chapter 6). 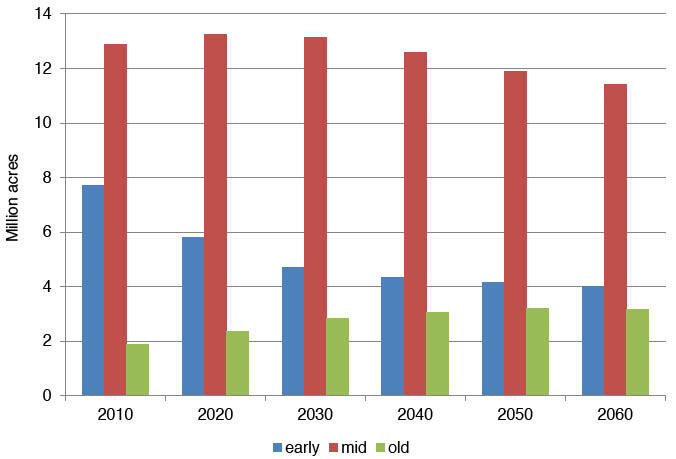 Figure 5.24 shows forecasts of age classes for broad forest types for the high-urbanization/high-timber-prices/more-planting Cornerstone E. Early-age forests are those that are less than 20 years old, mid-age forests are between 20 and 70 years old, and old-age forests are greater than 70 years old. Because Cornerstone E has the largest change in forest management types (fig. 5.5) and the most harvesting (fig. 5.18), it is a “best” case for the production of early-age forests. 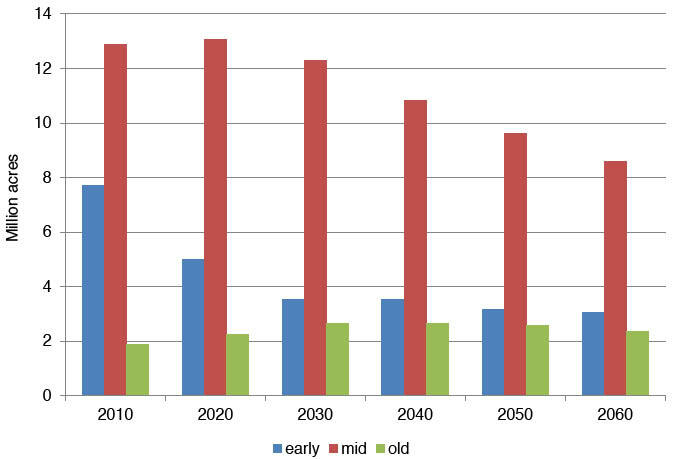 With the exception of planted pine, all forest types are forecasted to experience a decline in early-age forests throughout the forecast period for Cornerstone E. Planted pine forests are forecasted to shift their age-class distributions toward more mid-age forests as the rate of planting declines from its peak in the late 1990s. Mid-age forest area increases strongly, while early-age forest area increases at a more moderate rate. There are practically no acres of old-age forest in the planted pine forest type. High harvest rates and conversion to planted pine in Cornerstone E shifts the age-class distribution of the naturally regenerated pine types. The area of old-age natural pine stays relatively constant while mid-age forests decline by 13 million acres (about 64 percent) and early-age forests decline by about 4.5 million acres (58 percent). Oak-pine shows a similar pattern of age class changes. In contrast to the softwoods, hardwood forecasts show an increase in old-age forests. For upland hardwoods, the area of mid-age forests is forecasted to decline by 14 million acres (down from 59 percent in 2010 to 47 percent in 2060). Over this same period, old-age forests are forecasted to increase by 12 million acres (up from 20 to 40 percent) and early-age forests decrease by 8 million acres (down from 21 to 13 percent). 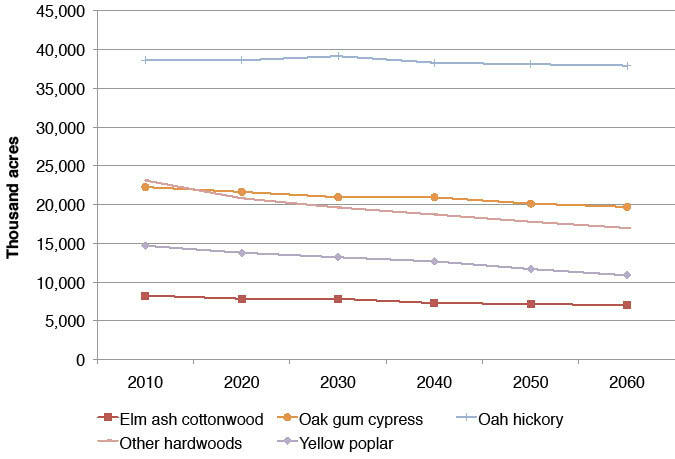 Overall, the shift among age classes reveals that the early-age component of the upland hardwood type declines by 44 percent at the same time that the old-age component increases by 71 percent. The pattern of change for lowland hardwood forest types is similar to changes in upland hardwood forest types, but changes occur at different rates. The mid-age component of lowland hardwood forests declines by about 5 million acres (26 percent), the old-age component increases by about 4 million acres (77 percent), and the early-age component declines by about 2 million acres (33 percent). As with the upland forest types, while the total area of the forest type declines, the average age of the forest type increases. Contrary to Cornerstone E, Cornerstone F (fig. 5.25) is characterized by less planting and a lower harvest rate (fig. 5.18). The results for Cornerstones E and F therefore bracket the age-class results for all Cornerstones. For Cornerstone F, the area of early-age planted pine declines over time (in contrast to increases simulated under Cornerstone E), and the age class distribution approaches a stasis. Cornerstone F also results in less dramatic changes in area of natural pine when compared to Cornerstone E, with more stability in the early-age class, increases in the old-age class, and a 33-percent reduction in declines of the mid-aged class. This pattern is mirrored in the oak-pine age classes. For hardwood forest types, however, there is little difference between Cornerstones E and F. This indicates that management changes strongly influence the age structures of the softwood forest types but have little influence on the age structures of hardwood forest types. 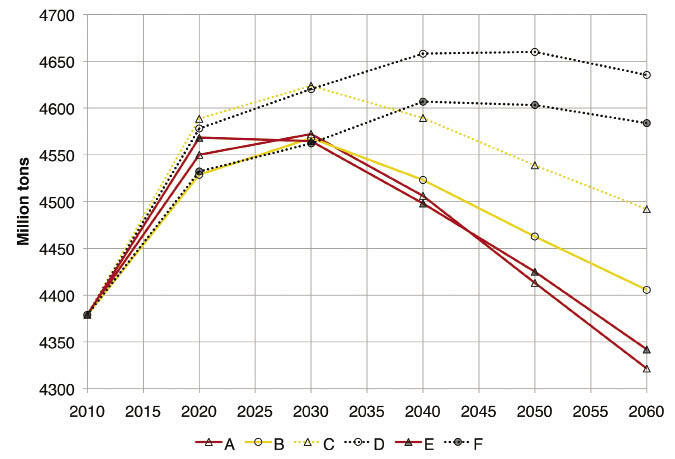 Figure 5.22—Forecasts of the area of hardwood forest types, 2010 to 2060, for Cornerstone B, which is characterized by high urbanization and low timber prices. 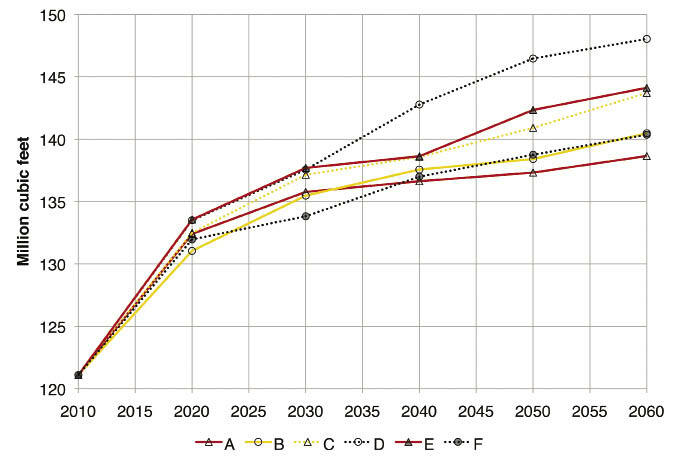 Figure 5.23—Forecasts of the area of softwood forest types, 2010 to 2060, for Cornerstone B, which is characterized by high urbanization and low timber prices. 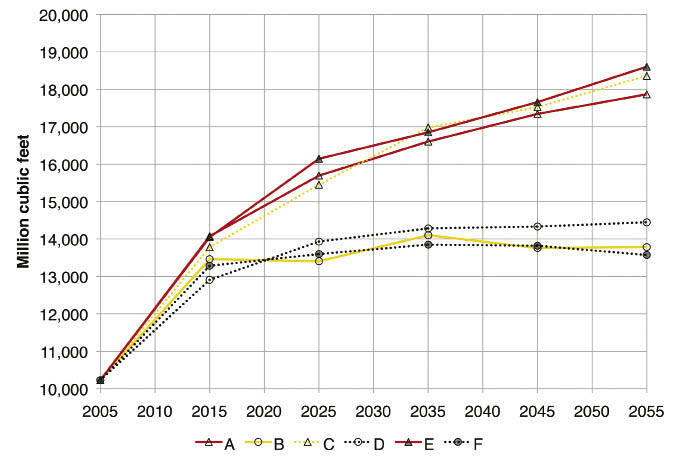 Figure 5.24—Forecasts of forest age classes, 2010 to 2060, for (A) planted pine, (B) natural pine, (C) oak-pine, (D) upland hardwood, and (E) lowland hardwood management types under Cornerstone E, which is characterized by high urbanization, high timber prices, and more planting. 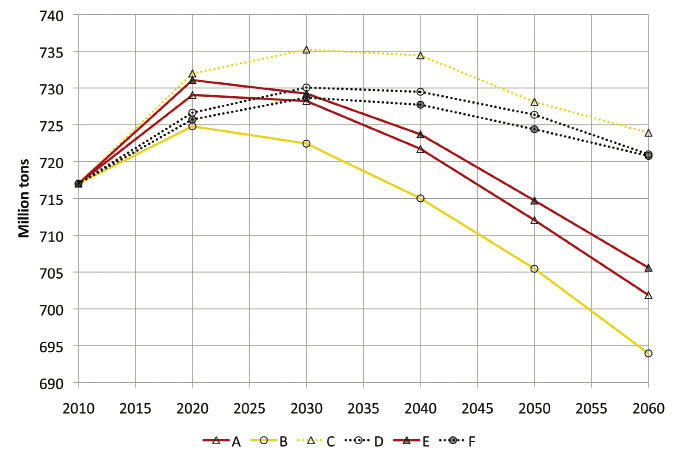 Figure 5.25—Forecasts of forest age classes, 2010 to 2060, for (A) planted pine, (B) natural pine, (C) oak-pine, (D) upland hardwood, and (E) lowland hardwood management types under Cornerstone F, which is characterized by low urbanization, low timber prices, and less planting. A number of forces of change will affect the development of forests over the next 50 years. The U.S. Forest Assessment System, which accounts for land use changes, climate change, and forest management, is used here to forecast forest conditions for six Cornerstone Futures. Each Cornerstone describes the future in terms of human population, personal income, climate, and the markets for products from rural land uses. Across all of these Cornerstones, total forest area declines and changes among broad forest management types are substantial. Among the five forest management types, only planted pine is expected to increase in area from 2010 to 2060. 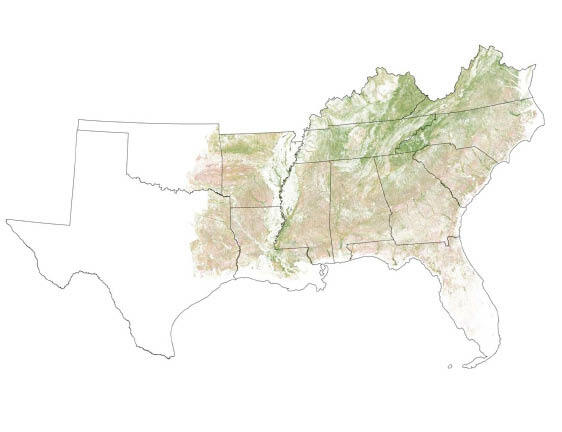 In 2010, planted pine comprised 19 percent of southern forests. By 2060 planted pine is forecasted to comprise somewhere between 24 and 36 percent of forest area. The midpoint of this range of growth (20-72 percent) is consistent with a recent study by Zhang and Polyakov (2010) that forecasts a 40 percent expansion in planted pine in the South. Forest types are influenced differentially by urbanization and timber market dynamics. In general, hardwoods are more strongly influenced by urbanization, and softwoods are more strongly influenced by forest management. Although predicted rates of change vary, all forecasts reveal that land use changes and conversion to pine plantations will result in a continuing downward trend in naturally regenerated pine types. Hardwood types are most strongly influenced by urbanization and all Cornerstone Futures show declines in hardwood area that vary in direct proportion to rates of urbanization. Nearly all forests in the South have been harvested at least once and much of the region’s forests are the result of reforestation and an accumulation of biomass. After a long period of accumulating biomass, the South’s forests are forecasted to reach a maximum by 2030 and then to either level off or decline. Southern forests also define a large pool of terrestrial carbon amounting to 12.3 billion tons. Mirroring changes in growing stock volumes somewhat, this pool of carbon is forecasted to reach a peak from 2020 to 2030, and then decline over time. Urbanization patterns are the dominant determinates of the size of the future forest carbon pool, although stronger forest product markets can ameliorate carbon losses. Forest forecasts address change in climate variables by associating forecasted, multiple year averages of temperatures, precipitation, and potential evapotranspiration with historical conditions. The potential effects of other changes, most notably CO2 enrichment do not enter the analysis. Controlled experiments show increased productivity with CO2 fertilization but also highlight the important interaction with nitrogen, precipitation, and other climate and site variables in determining response (McCarthy and others 2011). These types of impacts on productivity are relatively subtle compared to the variability of field inventory measurements and could not be factored into the forecasts. The potential effects of atmospheric carbon on forest biomass at a regional scale remains an important uncertainty. The South produces the majority of timber products in the United States (more than 60 percent) including a diversity of both hardwood and softwood outputs. Forest management has increased harvesting throughout the South since the 1960s, and the output per unit of growing stock has increased as management has intensified. The most important factor in changing the productivity of southern forests is the expansion in the amount of planted pine forests. Because of increases in timber supply from 1990 to 2010, removals of forest biomass (growing stock) are forecasted to increase for all Cornerstones, even those that project decreasing prices. Removals of softwood pulpwood are responsive to futures for forest planting and product prices. 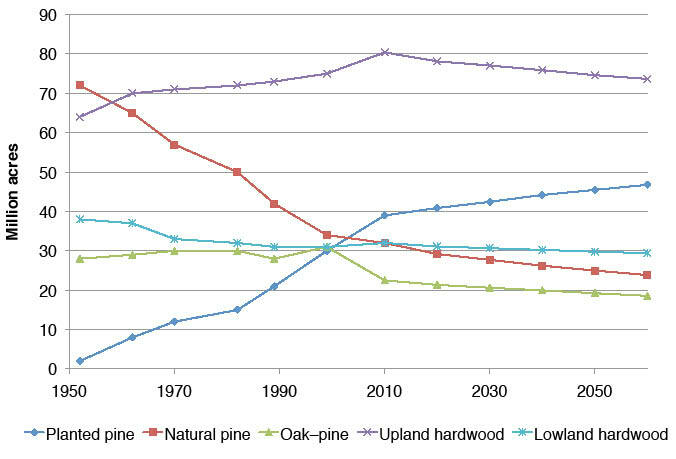 Under a high price future, softwood pulpwood output would increase by 56 percent, roughly equal to the expansion in output observed between 1950 and 2000. These projections of removals are based on the price assumptions of the Cornerstone Futures and not on forecasts of demand. 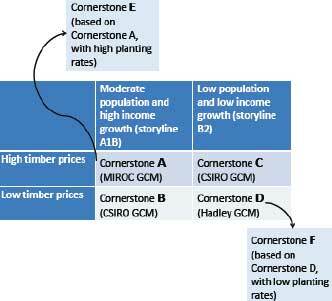 Timber harvest forecasts under various market conditions linked to the Cornerstones are discussed in chapters 9 and 10. The combination of land use change, management intensities, and climate result in a number of changes in the composition and structure of the region’s forests. The forest type composition of the broad forest management groups are forecasted to change and the age structure of these forests are also altered. Although the overall loss of upland hardwood acreage is forecasted to be in the range of 8 to 14 percent, the oak-hickory forest type remains essentially constant. The yellow-poplar forest type is forecasted to decline the most, with the highest losses forecasted for the Piedmont. The age and species structure of softwood forest types is most strongly influenced by forest harvesting and management tied to timber markets, while the future structure of hardwood forests is most strongly affected by urbanization-driven land use changes (increased population growth and income). Reductions of naturally regenerated pine forests are not equally distributed among age classes: mid-age and early-age forests decline but old-age forests remain relatively constant. For hardwoods, the age distribution of both upland and lowland hardwood types shift, with less of these forest types classified as early age and more classified as older age. Heath, L.S. ; Smith, J.E. ; Skog, K.E. [and others]. 2011. 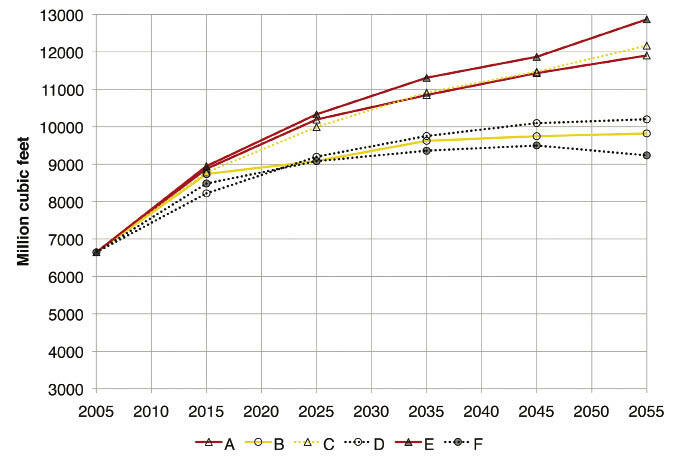 Managed forest carbon estimates for the U.S. greenhouse gas inventory, 1990-2008. Journal of Forestry. 109(3): 167-173. Intergovernmental Panel on Climate Change (IPCC). 2007a. Climate change 2007: synthesis report. Geneva, Switzerland. http://www.ipcc.ch/publications_and_data/ar4/syr/en/contents.html. [Date accessed: January 24, 2012]. Intergovernmental Panel on Climate Change (IPCC). 2007b. General guidelines on the use of scenario data for climate impact and adaptation assessment. 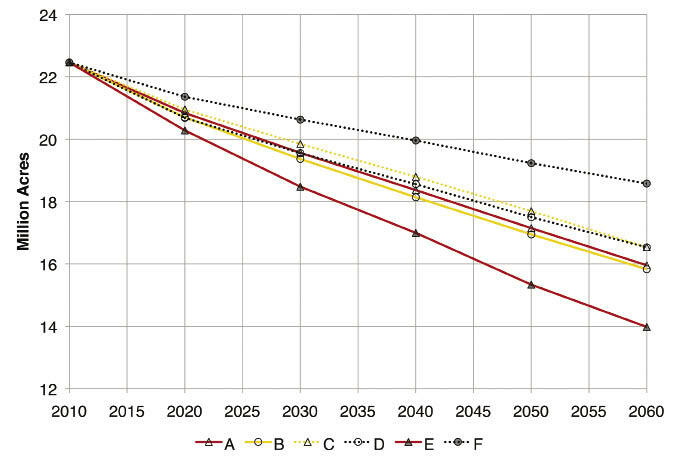 http://www.ipcc-data.org/guidelines/TGICA_guidance_sdciaa_v2_final.pdf. [Date accessed: January 24, 2012]. Linacre, E.T. 1977. A simple formula for estimating evaporation rates in various climates, using temperature data alone. Agricultural Meteorology: 409-424. Vol. 18. McCarthy, H.R. ; Oren, R.; Johnsen, K.H. [and others]. 2011. Re-assessment of plant carbon dynamics at the Duke free-air CO2 enrichment site: interactions of atmospheric [CO2] with nitrogen and water availability over stand development. New Phytologist. 185(2): 343-589. Miles, P.D. ; Brand, G.J. ; Alerich, C.L. [and others]. 2001. The Forest Inventory and Analysis database: database description and users manual. Version 1.0. Gen. Tech. Rep. NC–218. St. Paul, MN: U.S. Department of Agriculture Forest Service, North Central Research Station. 130 p.
Smith, J.E. ; Heath, L.S. ; Nichols, M.C. 2007. U.S. forest carbon calculation tool: forest-land carbon stocks and net annual stock change. Gen Tech. Rep. NRS-13. Newtown Square, PA: U.S. Department of Agriculture Forest Service, Northern Research Station. 28 p.
U.S. Department of Agriculture (USDA) Forest Service. 1988. The South’s Fourth Forest: alternatives for the future. For. Res. Rep. 24. Washington, DC: U.S. Department of Agriculture Forest Service. 512 p.
Wear, D.N. ; Greis, J.G. 2002. Southern Forest Resource Assessment: summary report. Gen. Tech. Rep. SRS-54. Asheville, NC: U.S. Department of Agriculture Forest Service. Southern Research Station 103 p.
Zhang, D.; Polyakov, M. 2010. The geographical distribution of plantation forests and land resources potentially available for pine plantations in the U.S. South. Biomass and Bioenergy. 34(12): 1643-1654. Robert Huggett is a Research Assistant Professor, Department of Forestry and Environmental Resources, North Carolina State University, Raleigh, NC 27695. David N. Wear is the Project Leader, Center for Integrated Forest Science, Southern Research Station, U.S. Department of Agriculture Forest Service, Raleigh, NC 27695. Ruhong Li is a Research Associate, Department of Forestry and Environmental Resources, North Carolina State University, Raleigh, NC 27695. John Coulston is a Supervisory Research Forester, Forest Inventory and Analysis Research Work Unit, Southern Research Station, U.S. Department of Agriculture Forest Service, Knoxville, TN 37919. Shan Liu is a Research Assistant, Department of Forestry and Environmental Resources, North Carolina State University, Raleigh, NC 27695. Because of data limitations the U.S. Forest Assessment System does not yet address changes in forest conditions in Texas and Oklahoma outside of their eastern survey units that are heavily forested. The magnitudes of forest area changes reported in this chapter differ from those in chapter 3 because (1) the analysis in chapter 3 is based on National Resource Inventory data benchmarked in 1997, while this chapter translates those projections into FIA data benchmarked in 2010; and (2) while the NRI measures only non-Federal land uses, the FIA data address all ownerships. Econometric studies show that sawtimber products are the most price-responsive in the short run. However, in the long run, investments in new pine plantations have led to substantial increases in pulpwood production.